see who opened, what they clicked on, and more! *Click the links or images to view full screen samples. To exist full screen, click on open report or press <esc>. A Summary listing of all your email delivered campaigns vital statistics. Open Stats - see who, when & how many times they opened your email. Link Stats - Shows which links where clicked, how many times and by who. Results can be used to optimize your content in the next campaign. Bounce Stats - See who's email was not delivered and why. Unsubscribe Stats - See who and when they un subscribed. Forwarding Stats - Records who forward the email and where when use with a "Send to Friend" link in your email. Mailbox Monitor - A Summary Report on all our email campaigns' performance. Delivery by ISP -Tracks email deliverability to all the major ISPs via a robust seed list and quickly alerts us when emails are being blocked or filtered. For each campaign sent, we receive an ISP delivery status report, confirming how much of your campaign arrived, when, and what folder it was placed in (i.e. inbox or bulk). Reputation Monitor - Helps us keep tabs on the people who are keeping tabs on us (A credit score for our email program). We know where we stand, how we’re being evaluated by email receivers, and what we need to change about our program to improve our delivery rates. We test for delivery and rendering problems before we send your campaigns and then fix the problems that will hinder delivery and response before sending to your entire list. Now, you can see what your campaigns will look like across primary ISPs and mail readers, determine whether HTML will break or images won’t be displayed, and know whether campaigns will fail common filtering packages. 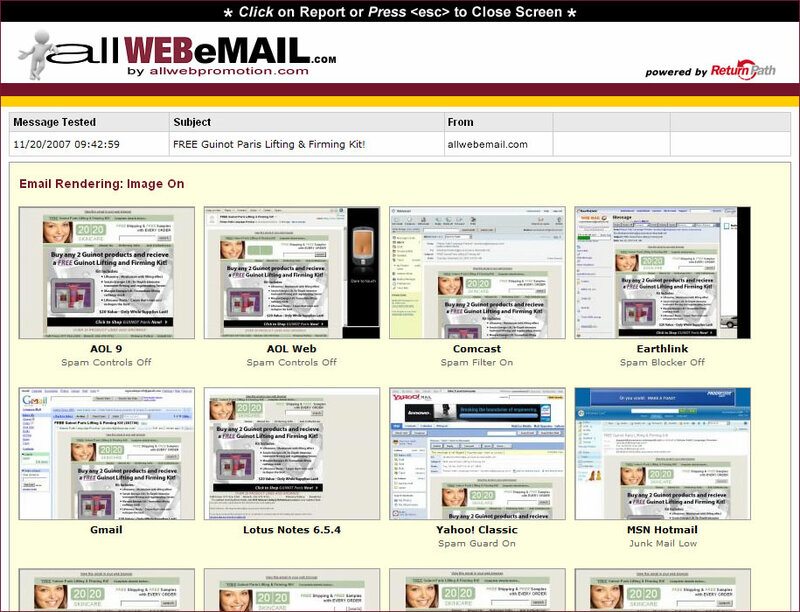 Email Rendering - an at-a-glance preview of how your email will look across the major ISPs and email readers with either images 'on' or 'off'. Content Assessment - a comprehensive report showing HTML code errors, link integrity & reputation, spelling errors and spam words in both HTML & Text version emails. Spam Filter Check - displays an emails performance and whether a campaign will fail the most common spam filtering packages.